Well I said there was a craft coming to correlate with my cornucopia history lesson and here it is! 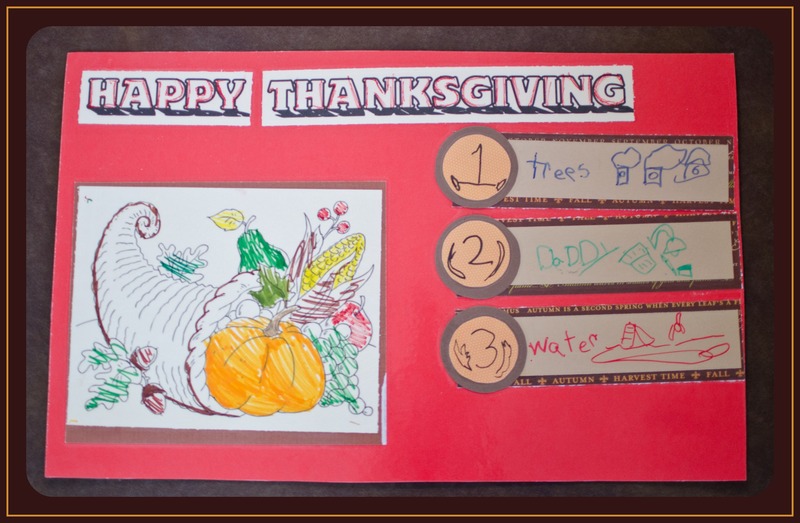 I thought it would be an excellent idea to make our own place mats to use on Thanksgiving Day and incorporating the cornucopia or “Horn of Plenty” was a cinch. The supplies needed for this project were mostly basic for those who have scrap booking supplies handy. The only things I had to buy were contact paper and colored poster board. To make the construction of this project more smooth and to save time, I precut all the rectangles, circles, and coloring pictures (including a large cornucopia) my girls would need to layer. They had their hands full enough with gluing and coloring to make for a creative experience. Besides, I doubt my five or two year old would have had the patience all that scissor handling would have required! The goal was for the place mats to be constructed similarly to the above photo. I put my two year old’s together for her and just let her color away. This kept her involved while at the same time, gave my five and seven year old a visual guide. As a perfectionist I can tell you that it took ALL of my self control not to direct my older girl’s placements during gluing. The urge to take over and make sure everything was centered almost conquered the belief that my girls needed to be free to own the experience and practice those skills for themselves. But I kept my distance because I know the genuine work of my children’s hands are precious keepsakes and my involvement would have killed the innocence. Once my girls were satisfied with their mats, I covered both the front and back with clear contact paper and trimmed it. I was forced to trim tightly to the edges because I had cut the poster board a little large. It’s ideal, however, to have a lip of contact paper all the way around so that liquid spills (which with my girls happens three times daily) do not seep through. The last final touch, which I am so tickled to share, will explain why there are three blank rectangles to the right of the place mats. These are the spaces we created to write down things we are thankful for. Contact paper is compatible with dry erase markers which makes it possible for us to erase and rewrite a new set of “thanks” as often as we want! What child doesn’t like to write and erase? This feature far extended the life of and excitement for the project. Not only that, but many thanks were able to be encouraged and given to our Lord at the perfect time of year! 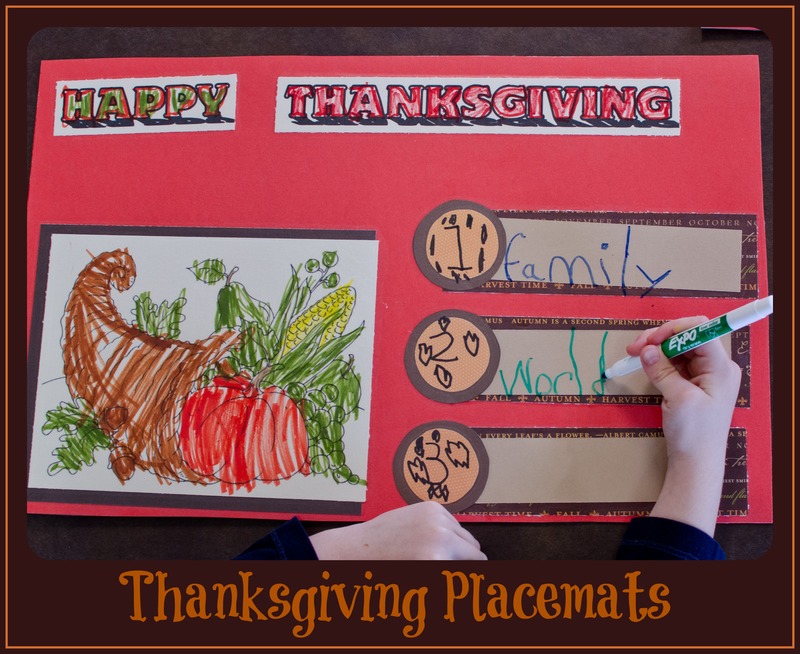 This entry was posted in Thanksgiving Place Mats - Rewritable and tagged Children and Youth, Contact paper, Cornucopia, craft, dry erase, Holiday, Holidays, homeschool, kids, Place Mats, rewritable, scrapbooking, thankful, thanks, Thanksgiving. Bookmark the permalink.